The president subtly changed the metaphor this morning in a major financial address. Instead of the phrase health care reform he used the phrase health insurance reform. Ah , now we are framing the right debate. Was this metaphorical or strategic? We have argued for months now that this is not about health care reform. Want real health care reform — you change the paradigm. Read Deepak Chopra’s OpEd this morning in SFGate. Then read all our past and future posts. The advent of the 21st century is quickly evolving. Old paradigms, companies, and entire industries are vanishing. 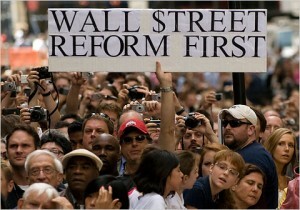 The current debate is about economic reform. And economic reform is about insurance reform — catastrophic economic reform. There’s another way. There’s two countries in Europe that have universal health care without–and it’s entirely run by insurance companies. But they treat the insurance companies like regulated utilities. If the insurance companies would prefer to be treated like regulated utilities, we’d drop the public option in a heartbeat. This graphic from the morning’s news even better. Shows that the administration may be serious about the fundamentals of a healthy economy first.